Muay thai is known as the “art of eight limbs” for the eight parts of the body that are used for striking: the two hands, two legs (shins, mostly), two elbows, and two knees. Here are eight more facts about this sport, one for each of the limbs! My first muay thai coach always said the sport was “a war of attrition:” all about hurting the other person as much as possible before they could hurt you. This is appropriate, as is the “combat” portion of its name. Muay thai developed from battlefield tactics. Obviously, ancient Thai fighters would have had weapons too. But if you are disarmed or your weapon breaks, the middle of a battle is a bad time to have to stop and look for a replacement. These combat techniques were designed to make the soldiers as effective and deadly as possible, even without weapons. It wasn’t until the late 17th century that muay thai was practiced as a sport, and it wasn’t codified until the 1930’s. 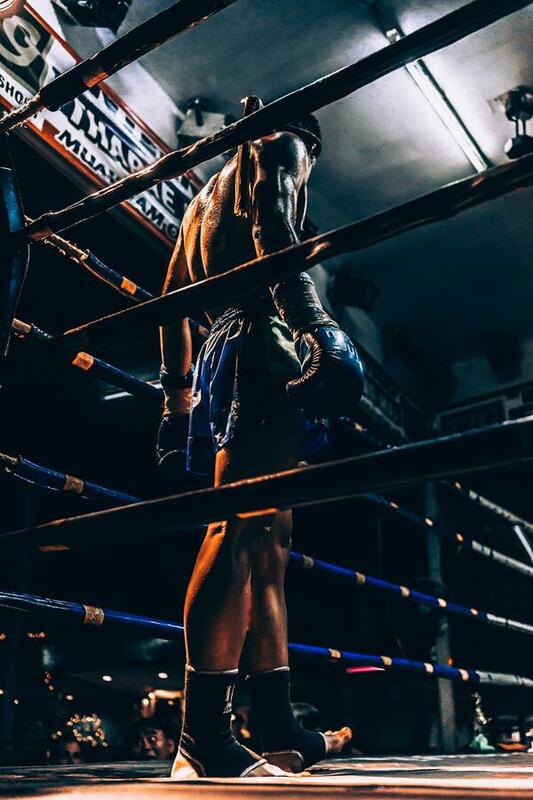 Muay thai is the best-known Thai art, however, several others exist including muay korat, muay thasao, muay chaiya, muay lopburi, muay jerng and muay boran. There is also muay lao, which is from Laos, not Thailand, but is very similar. Generally speaking, the others can be considered regional styles rather than separate arts (muay thasao and muay jerng from northern Thailand; muay korat from the east; muay lopburi from central Thailand; and muay chaiya from the south.) Muay boran is more of an umbrella term that simply refers to ancient Thai arts on a whole, and, unlike muay thai, allows head-butts – technically making it the art of nine limbs. 3. March 17th is National Muay Thai Day. In Thailand, anyway. Sorry, everywhere else! To be fair, it is the county’s national sport, so it deserves a holiday. This date celebrates a famous historic event. As the story goes, way back when in the 1700s, Burma and Siam (present-day Thailand) were in the middle of war. The Burmese invaded the capital of Siam and did what invading forces are prone to doing: burn, loot, and capture prisoners. These prisoners were then brought back to Burma. Among the captives was a man named Nai Khanom Tom, who just happened to be a famous Thai fighter. Like most winners, the Burmese wanted a party to celebrate their victory. They threw a festival, and one of the main events was forcing their Thai prisoners to go up against champion Burmese fighters. Nai Khanom Tom defeated not just one, but ten, of their best fighters in back-to-back bouts. This so impressed the Burmese king that Nai Khanom Tom was granted his freedom and allowed to return to Thailand, where he was regarded as a hero. He spent the rest of his life teaching muay thai, and is still remembered as “The Father of Muay Thai” to this day. 4. Muay thai is a highly ritualized sport – we just don’t often see that part in the West. We all know the hand-slap/fist-bump before the roll in jiu-jitsu, and the bowing common in most Asian martial arts. Because muay thai is, at least in the US, taught primarily for use in MMA, some of its more formal aspects are often overlooked. One example of this is the Wai Kru (or Wai Khru), the dance performed by competitors before a fight. The movements of the dance show respect for one’s teacher and opponent, and sometimes to the Buddha as well. The origins of the Wai Kru are sometimes also attributed to Nai Khanom Tom and his legendary fight in Burma. Here’s a video example of a fighter performing the Wai Kru. You can also see he’s wearing the traditional armbands (pra jiad) and headband (mongkhon) of a Thai fighter. 5. Gloves? We don't need no stinkin' gloves! Of course, nice padded leather gloves, or others made from modern materials, haven’t always been around. Most striking sports have been fought bareknuckle at one point. However, ancient Thai fighters took it a step further. They would wrap their hands in hemp rope, and, sometimes, dip their rope-wrapped hands into a glue-like resin, then coat them with shards of crushed glass and ash to attack their opponent’s eyes. As you may have guessed, these hemp wraps were less about protecting the fighters’ hands and more about inflicting maximum damage. Surprisingly, muay thai wasn’t the only sport where practitioners had the idea to do this. In the Nigerian martial art dambe, practitioners wrap their dominant hand in rope. It used to be legal for fighters to dip this rope-wrapped hand in glue and glass. At least dambe only had one glass-shard hand, rather than two, which makes it safer? I guess? 6. Glass shards or no, muay thai is still brutal. Poisonings are also common. Muay thai fights are a huge draw for gamblers, and some will take any measures to ensure they win. Sometimes, an unwary fighter will find him or herself offered a pre-fight drink (often from someone in his or her own camp who has, unbeknownst to the fighter, been bribed by a rival gambler), and accept it, only to become sick and sluggish at fight time. The goal of these poisonings is not to kill the fighter, just incapacitate them so the gamblers can ensure they bet on the winner. This fact is also a mea culpa. I’ve definitely mixed up the two, although it's been more out of laziness (or the desire to simplify what art I was training in for people who didn’t know what muay thai was) than ignorance. It’s not as bad a mistake as doing a karate chop when someone tells you they do judo, but still. There are other stylistic variations as well, but these are the key ones. 8. Although muay thai hasn’t made quite as big a splash in Western pop culture, you can still find it if you look! Karate, ninjitsu, and boxing are all over the place: in movies, TV, books and video games. But outside actual gyms, muay thai has been slower to catch on (unsurprisingly, it’s huge in Thailand – “muay thai” is practically its own movie genre). There are a few famous examples of muay thai in American pop fiction. The Jean-Claude Van Damme movie “Kickboxer” is one. American author Paolo Bacigalupi’s award-winning dystopian sci-fi novel The Windup Girl is another. It features a muay thai fighter as one of the main characters (this book was actually how I heard of muay thai. I highly recommend it). Several characters in the “Street Fighter” video game franchise also use muay thai as their style. That’s all for now! What’s your favorite muay thai or martial arts fact? Share away in the comments below! Thinking of training muay thai? Check out these tips for your first day!